WATKINS GLEN -- Continuing coverage now of Governor David Paterson's proposed budget, and its effects on the Southern Tier -- the state's lucrative wine industry could see funding cuts and higher taxes. The governor wants to nearly triple the excise tax on wine, from 19-cents to 51-cents per gallon. “Having them be completely drained of their public funding will definitely adversely impact the growth curve we've enjoyed the past several years,” said Thomas. “[But] it does not impact our ability to survive and thrive quite frankly. We're going to keep doing what we do." Thomas says business on the Seneca Lake trail this year was about the same as in 2007. 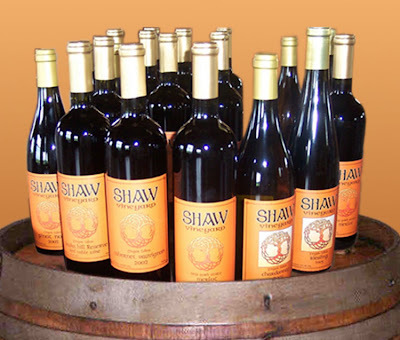 Wine Spectator Reports: New York Grocery Stores to Carry Wine? New Yorkers may finally be able to buy Chardonnay and brie at the same time in their local supermarket if a provision in Gov. David Paterson's budget passes the state legislature. As part of a laundry list of proposals for closing a $15.4 billion deficit, Paterson has proposed legalizing wine sales in grocery and convenience stores. So, I had a meeting today in Pawtucket with the fine folks from Hasbro. We discussed many new book ideas and come up with some really good concepts. To get there and back, I had to drive from our farm in upstate New York. It was the easiest route. Unfortunately, we are in the middl of an ice storm. It's beautiful...but I am haunted that ice storms are sometimes tragic, like in the novel and movie The Ice Storm (Kevin Klein, Sigourney Weaver, Toby McGuire, Nina Ricci, and many others. So, since I arrived early, I decided to stop at this giant liquor warehouse, and see if they had any local wines. I trolled and found a few. When my meeting was over, I called my wife on the cell, and she told me to be careful, because of the ice. For sure, the ride home was slow and agonizing. It was cold and raw. I found a wine I opened...Nantucket Vineyard Merlot 2004. I was curious. 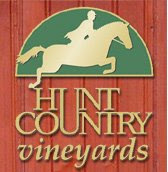 According to their website, "Located in the pastoral heart of Nantucket on the way to Cisco Beach , Nantucket Vineyard was established in 1981 by Dean and Melissa Long. Next year marks the 25 th anniversary of our vineyard and we hope you'll join us in person to celebrate this special occasion." The cool part about these folks is that they also distill spiritis and make beer. They're the classic "triple threat." "Part of the mission along the way has been to educate consumers about the production process involved – now islanders and visitors alike have had their consciousness expanded in regard to our fine hand-made libations." As to wine, they write, "Combining old world techniques with state of the art technology Dean Long's selections include unique and delicious wines that you won't find anywhere else. 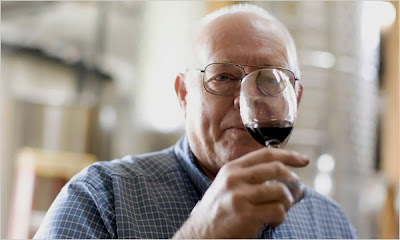 No longer restricted by the islands geography and climate, Dean now finds the best grapes in the given year, and the wines are better than ever." So I am even more curious now. I am sitting with a big bowl of pipping hot penne with arabiata sauce and meatballs. The steam is rising from the bowl as the plow trucks rumble by outside. The wine has a pleasant aroma. A nice scent of oakiness. 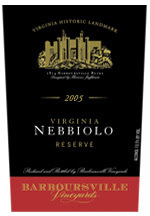 In reading the label, one finds out that these merlot grapes were grown in Washington state, but the wine was made here. And a lovely pluminess to it's deep, red color. A nice drinking red. Of course, they're located on Nantucket. But if this wine is any indicator, there's a lot to look forward to on our next visit to that island. We'll want to tatse the Nantucket Vineyards line of wines, as well as their line of fine ales (sold in champagne bottle like French farm house ciders or fine Belgian ales to be cellared), and their distilled spirits from the Triple Eight Distillery including vodka and rum. This was a nice wine and we are most intrigued. And kudos to these folks for the Trple Treat combination. The whole Nouveau est arrive' thing from France is so wearisome I let it pass for Thanksgiving. Watered down and downright funky -- think Bazooka Bubblegum and electric Kool-Aid with a pinch of Silly Putty -- this red has the shelf life of a sand gnat. Need proof? What's $11 today is $5 in late January. And then it really goes south for the winter. But I do love the Gamay grape. Westbend Vineyards in Lewisville has just released its 2008 Nouveau, complete with a kind of '70s retro label that may (or may not) be spoofing the ubiquitous Georges DuBoeuf flower label. I wish Westbend had ditched the retro look and the whole "Nouveau" tie-in because this red -- fruity and slightly medium-bodied -- could stand on its own, simply stated as Gamay on the label. 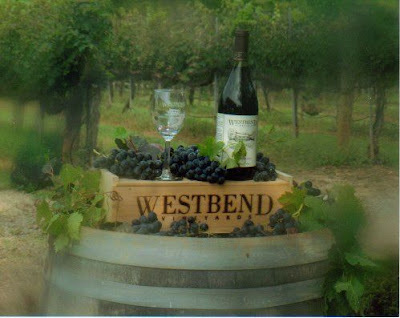 Westbend Vineyards pioneered French varietals in North Carolina -- and one of the earliest vines planted there was Gamay. 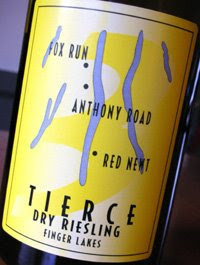 Few Tarheel wineries have followed suit with this grape. All of which adds to Westbend's pioneer reputation. 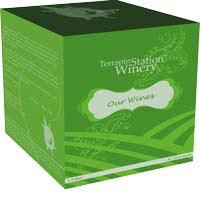 Winemaker Mark Terry did a nice job bumping up color and complexity by adding in 15 percent Merlot. Still, even at that blending level, this showcases Gamay in all its glory. It's easy for diners to be confident when ordering their favorite domestic beer, or a common cocktail that every bartender knows how to prepare. Hand them a wine list, though, and all confidence goes out the window. The average diner tends to be less than well-educated when it comes to pairing wine with their meals, or knowing how to serve it. 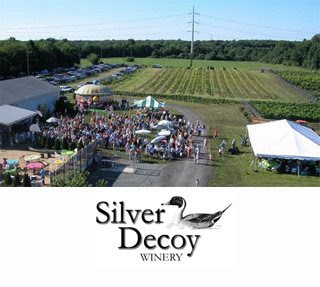 According to Marco Bucchi, winery-operations manager at the Renault Winery in Galloway Township, there are an average of 10,000 new wines released each year, adding to what's already out there. More choices only mean more confusion. "Many end up picking (one) because the label looks good, which is, of course, totally random and nothing to do with the nose or taste of the wine," Bucchi says. "Your restaurant sommelier can help, but they could lean towards the steeper-priced vintages." To avoid turning ordering a glass of wine into a major ordeal, it's important to educate yourself about the wines that are available to you and the things you should or should not be doing to enjoy them. The first thing Bucchi says you should know when learning about wine is that a vintage doesn't need to hail from California or France to be good. 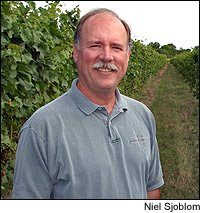 Southern New Jersey vineyards are holding their own and offering some excellent options for wine drinkers, he says. 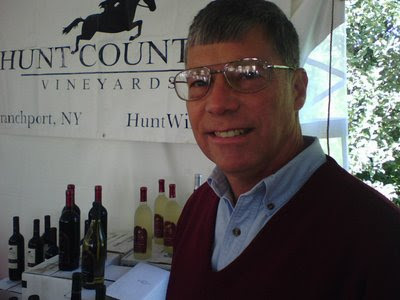 According to Bucchi, the climate in central and southern New Jersey is very conducive to growing several types of grapes. 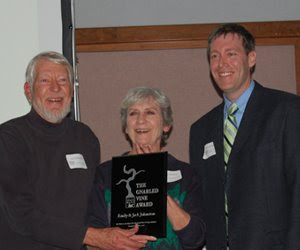 Area farmers have taken it upon themselves to expand their knowledge of grape growing over the past several decades. 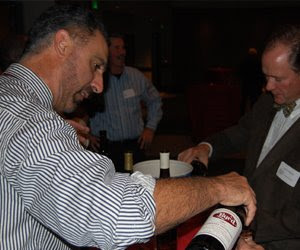 "South Jersey wines are keeping pace with the new wines from many areas of the world," Bucchi claims. 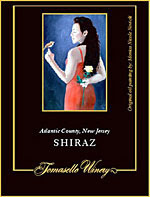 "Australia has its Shiraz (grape), and southern New Jersey has its Cynthiana or Norton." So when scanning the wine list, keep your eye out for wines from local vineyards like the Renault Winery, the Cape May Winery, [Turdo Vineyards], and Tomasello's Winery in Hammonton, just to name a few. Few things are more embarrassing than stumbling over the wine list at a fancy restaurant. Try following these tips you find yourself on the spot. No red and white rules: The old adage is "red wine with red meat and white wine with poultry or fish." But feel free to give yourself some wiggle room when it comes to that. A salmon dish can be paired with a red wine just as easily as a steak. 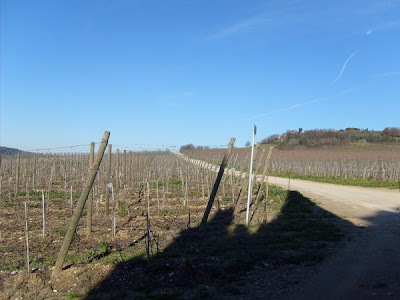 "With a broadened variety of wines and blends, the wines have become more complex," says Bucchi. "They have expanded their capabilities of what they can be successfully paired with." Weight: Keep the weight your entree and wine balanced so one doesn't overpower the other. A thick steak with onions and mushrooms would go best with a heavy red wine, while white fish would be best paired with a light white wine. Glass half full: Don't allow your server to fill your wine glass to the top, advises John Mahoney, a wine educator and a Buena Vista Township native. Instruct the server to fill the glass halfway so you can swirl the wine and oxygenate it to make the drink more refreshing. No hard alcohol: You've heard of no swimming for 30 minutes after eating. Well, don't try a new wine immediately after downing a martini. The hard alcohol numbs your palate, making wine tasting impossible. Bucchi recommends waiting 20 minutes between cocktails and wine. Don't go cheap: In light of today's economy, it's tempting to go with the cheapest wine on the menu. 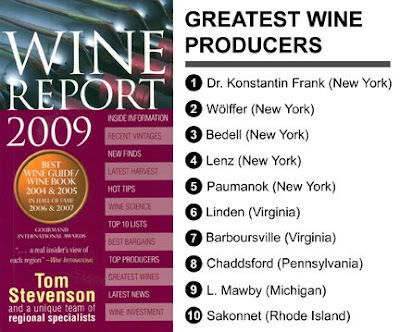 But according to Mahoney, these wines have the highest markup. A $21 glass of wine may only be worth about $5.99. 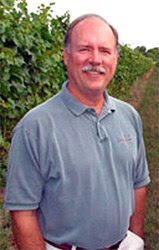 "Pick a wine right in mid-range," Mahoney advises. "That way, you're getting your money's worth." Serving wine at home can be almost as nerve-wracking as ordering wine at a restaurant, especially if you have guests. As the host, the success of the meal depends on you making good wine choices. Start with bubbles: No matter what wine you are serving with dinner, give your guests a glass of champagne to help cleanse their palate. "When people come in you don't know what they had for lunch, what they snacked on or if they're chewing gum," Mahoney says. Don't worry about dropping $50 on a bottle of French champagne. A $10 bottle of Cava, a Spanish sparkling wine, is just as good. Choices, choices: Offer a red and a white wine with dinner. Each guest's palate is different, and it may change over the course of the meal, depending on the main course. Pour early: Pour the wine before your guests sit down to dinner. It gives the wine time to breathe, and plus you won't be leaning over people trying to pour while they start their meal. Get smart: Even if you think you have a good grasp on wine, keep educating yourself. Mahoney recommends trying a different wine every time you go out to eat. 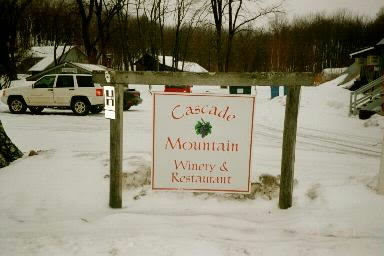 Also, keep an eye out for wine tastings and classes. The Renault, for example, offers wine education classes that address the different type of wines available and how they are made. McCarthy’s life plays kind of like a rap song. a boost when in 1991 he was asked by his old friend Dave Matthews to be the winemaker/part owner of his new business, Blenheim Vineyards. 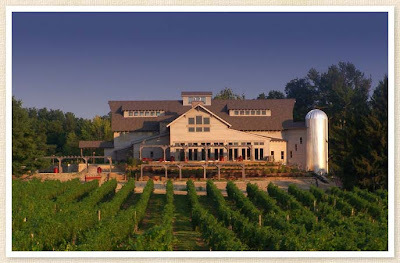 area’s top wineries in the ’80s. He worked a year at Acacia Vineyard in California before coming back to Virginia and scoring a gig as the first winemaker at White Hall Vineyards. Medals were won, a career was launched. Part II: Local boy becomes a star. 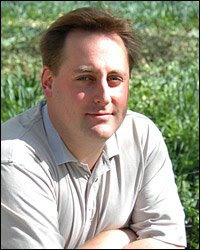 In 1999, his old friend Dave Matthews asked McCarthy to be the winemaker/part owner of his new business, Blenheim Vineyards. Success ensued—write-ups in major magazines, his name on the label. Part III: Creative differences (and a settlement stipulating that he and they cannot talk about those differences). The star (winemaker) parts ways with his record label (winery) and brings it all back home with nothing but his BMW and his love of music. “I was 40 years old and feeling burnt out,” McCarthy says of his time at Blenheim. Part IV: Here we go again. McCarthy is driving around in his sedan/coupe/convertible checking on his wine. Here are what he calls the economics of his plan. First to Virginia Wineworks to pick up some cases of the 2006 Merlot and Meritage he made at Michael Shaps’ rent-a-winery, the sale of which will help pay for the 2008 Riesling and Chardonnay he has fermenting in borrowed tanks at First Colony Winery. Then it’s over to the new Montfair winery where his Cab Franc sits in barrels. It’s all done through favors and trade. “My landlord is a de facto investor,” he says, which I take to mean he’s been a little late with the rent. 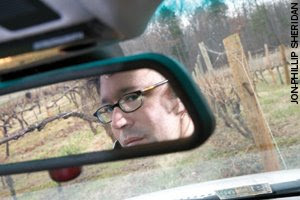 Brad McCarthy is a winemaker without a winery and that fact seems to scare him and excite him simultaneously. “I put my heart into it,” he says one night, smoking American Spirits and pouring his own Merlot. “I’m not just going up to a cubicle every day. Every moment I spend, every vintage I spend, is very precious. I’m 42. I don’t have that many left in me.” Spoken like a true rap star, albeit one whose hair is mad scientist messy and whose demeanor is more manic indie rock star than smooth hip-hop artist. McCarthy pulls the bimmer into Jefferson Vineyards, where he’s been helping out winemaker Andy Reagan for a little pocket money. Dragging hoses, fetching supplies, etc. There is a lot of good-natured ribbing of the guy with 21 years winemaking experience doing the jobs he used to pawn off to assistants. “You guys just come in and see me working and say, ‘Oh, how the mighty has fallen,’” McCarthy says, acknowledging in the same breath that he is both destitute and a star. “Fetch me a paper towel,” Reagan replies.